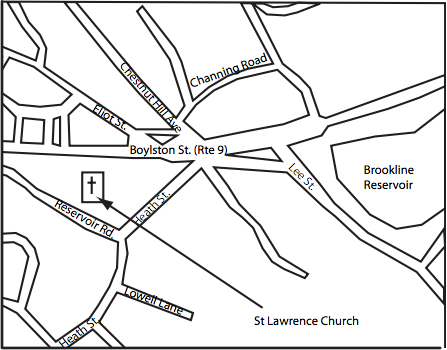 The Congregation of St. Athanasius worships at St. Lawrence Church, 774 Boylston Street, Boston, MA, off Route 9. The church’s telephone number is 617-738-5214. It is also very easy to reach by public transportation (details below). The church is wheelchair accessible; the parking lot is behind the church, and it is a level entrance into the church. There is an elevator for access to the undercroft and restrooms in the lower level. Note: the sign currently names only St. Lawrence church. The outbound stop is Boylston St at Timon Ave, the first stop after Boylston St. at Chestnut Hill Ave. The inbound stop is at the church, and is named “Opp 763 Boylston St”. The fastest transfer point is the Brookline Village station on the D Branch of the Green Line. Transfer is also possible from the B, C, and D branches of the Green Line at Kenmore station. The Reservoir stop on the D Branch of the Green Line is a 17 minute walk (0.8 miles). An Uber car from this location costs about $5.75. The schedule for the #60 bus is available from the MBTA here. Use these Google maps for the church and the parking lot. 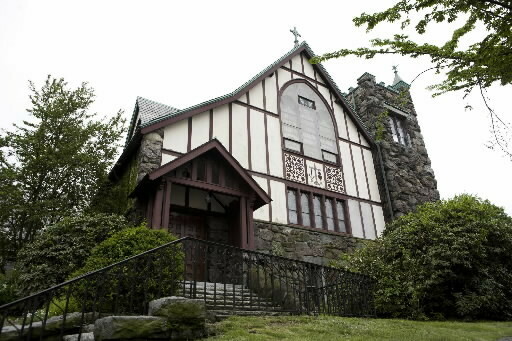 Use 30 Reservoir Road, Chestnut Hill 02467 for navigation to the parking lot behind the church. Take Route 128 to Exit 20A for Route 9 East. After 4.7 miles, turn right onto Reservoir Road to reach the parking lot behind the church. If you miss Reservoir Rd and pass the church on your right, the next street after the church is Heath Street (on the right), opposite Chestnut Hill Ave (on the left). A right onto Heath St brings you around to Reservoir Road and to the parking lot behind the church. Follow Storrow Drive to the Kenmore/Fenway exit. Outbound from downtown, this is the first exit just after Mass Ave. Keep left for the exit and left again on the Fenway ramp. Inbound on Storrow coming from Soldiers Field Road, the Fenway ramp is immediately after the Kenmore ramp and about a mile after the Brookline exit. Follow Fenway signs up over the Charlesgate flyover. On the flyover, keep right and follow signs for Boylston Street OUTBOUND. The Boston portion of Boylston Street ENDS at Brookline Ave and Park Drive, where you have two choices: Either continue slight left onto Brookline Ave and drive past the hospitals in the Longwood area (lots of traffic lights) to Route 9 OR for fewer traffic lights turn right onto Park Drive, then curve left onto the Riverway. Exit the Riverway at either Brookline Ave or River Street to Route 9. In either case, you will then take Route 9 outbound for 1.5 miles. Route 9 is in the process of a name change from Huntington Avenue to Washington Street when you first get on it at Brookline Ave or River St but changes names again to Boylston St (not the same Boylston Street as in Boston) in a few blocks. After the Brookline Reservoir (on your left) turn left onto Heath Street (the name of the street to the left) at Chestnut Hill Ave (the name of the street to the right) to come around behind the church and turn right onto Reservoir Rd and into the church parking lot. From Stuart/Kneeland Street, turn left onto Park Plaza and drive for 0.2 miles. Park Plaza becomes St. James Ave.
Drive for 0.3 miles and turn slight left onto the ramp. Drive for 0.1 mile and go straight on Route 9. Drive for 3.5 miles and turn left onto Heath Street. Drive 0.1 mile and go straight on Reservoir Road. Drive for 0.1 mile and the parking lot is on your right.